So this evening a couple of friends came over to watch Twilight while Josh was at the HUB (Wednesday night service @ UBC.) We began the movie about 7:00 so both kids were awake, Lilli went down relatively easily before 8:00. Roy usually goes to bed about 8:30 but when 8:30 came and I asked him if he was ready for bed he declined so I let him stay up a bit longer. At 8:45 I told him he could play for 5 more minutes and set a timer. I explained that when it beeped it was time for bed. A couple minutes in to it I noticed him walk away from his train table and head to his bedroom. A few seconds later I heard a small frustrated voice saying "nigh-nee, paci!" so I went to check on him to see what he was up to. What I found amazed me, he was in his bed looking for his pacifier so he could go to sleep! After finding him a new pacifier he said goodnight to our friends and hopped back in bed where I tucked him in, said his prayers and kissed him goodnight. I can only pray that all parents experience a bedtime as fluid as tonight! A minute or so after I sat back down to finish the movie, the timer went off. Well although the Wii has invaded many families, the Carneys are not one of them. We have been invaded by another 'Wee'. Roy has affectionately dubbed his slide and his swing as the Wees. This behavior is perfectly acceptable within the boundaries of our own house but you take this Wee talk to the playground and we have problems. A couple of days ago Roy was playing on a slide at Chick-fil-a and told his daddy he wanted to go on the Wee another child exclaimed "That's not a Wii!" It's a good thing Roy doesn't take criticism seriously yet. Roy's brush in with a real Wii-Roy's only personal experience with a true blue Wii was at our friend Holly and Britt's house. He's in a stage where he loves money, loves to look for it every where we go and when he finds it he saves it until he can find a bank. Well, while at Britt and Holly's he discovered a bank and Holly graciously got him out a big bucket of change to transfer into the bank. Of course Roy was in heaven and was thoroughly entertained for a good 20 min (an eternity in 2 year old time). Unfortunately the next time I checked in on him I realized that he was finding new places to slide the coins including their Wii! I stopped him before depositing a nickle but unfortunately a dime had already made the decent into the belly of the Wii. After fully disassembling it and finally digging inside with a cardboard 'hook' thankfully the dime was retrieved. Roy certainly hasn't collected enough loose change to cover the cost of replacing a real Wii. Here's a cute video of Lilli's first experience with a 'Wee' Roy was happy to help her fully enjoy it. There are some, that despite the depths within my own soul that grace has touch, I think fall outside the bounds of forgiveness. Gideon often incited a story from Phillip Yancey about a mother who would prostitute her two year old child to pay for her drug habit. He astutely shared the story in the context of Jonah thinking that perhaps God was offering too much grace in forgiving Nineveh of it’s horrors. I have two children now and the more I spend time with them the more valid responses like Jonah’s seem. That’s too much grace. I’d love if in these scenarios God would suspend the love/freedom project and magically lift this child from this situation and use one of Zeus’s lightning bolts to smite such a heinous sinner. God doesn’t and I wonder both why if the project is worth it. What’s more it’s one thing for God to refrain from the lightning bolt, but quite another to work to rescue this one who we’ll identify as one of Manning’s ragamuffins. The ragamuffin it would seem is beyond repair and a waste of my rehab funding tax dollars. The ragamuffin should have her child taken away and put in prison where she would suffer and slow and horrible death in retribution. The problem with our story is that we are a world full of ragamuffins even if we don’t want to admit it. Ever since great grandpa Adam ate fruit there seems to be this undeniable propensity within all of us to choose ragamuffin activity. Choice among our ragamuffin activity is our desire to judge. This is how I get away with calling down lightning bolts on our original ragamuffin. The ability to discern between good and evil, to see clearly that prostituting your child deserves hell. That’s where this raga would send that raga. William Young’s gift to this conversation is his chapter on judgment. I frame the situation me vs the raga. He reminds me that from the perspective the divine it’s this child vs this child and consequently boldly asks Mack to play God by deciding not between the teaching pastor and the skank, but rather between one child and the other. Who to send to hell? “I don’t want to be the judge,” he said, standing up. Mack’s mind was racing. This couldn’t be real. How could God ask him to choose among his own children? There was no way he could sentence Katie, or any of his other children, to an eternity in hell just because she had sinned against him. Even if Katie or Josh or Jon or Tyler committed some heinous crime, he still wouldn’t do it. He couldn’t! For him, it wasn’t about their performance; it was about this love for them. ‘I can’t do this,’ he said softly. ‘I can’t do this,’ he said louder and more vehemently. ‘You must,’ she said again, her voice softer. ‘I…will…not…do…this!’ Mack yelled, his blood boiling hot inside of him. So the first time I really had to think about this was when I was in college in the thick of figuring out the differences between Calvinism, Arminianism and Open Theism. Naturally the question of human freedom comes to the forefront. I didn't quite understand what my reformed was asking or rather replying, but now I know his intent was to remind me how much more complicated human freedom is than just the principle of alternative possibilities or compatiblism. As we listen to the sciences and other arenas of thought we discover more and more constraint. I don't think this means that we are automatrons nor does it mean that we enjoy the kind of omnipotence in ability that God does. We are constrained by hundreds perhaps even millions of factors every time we make a choice. Somewhere in the middle of all of this is human freedom. this is my first a of a number of posts on William P. Young's The Shack. the following is an important paragraph that succinctly sheds light on this thought in a way I have not read elsewhere. Mack is in a conversation about God and they stumble across this conversation. This is what God says about freedom. I’m trying to preserve the reverence I have for the moment. You only bring a child home for the first time a couple times in your life. There are few occurrences that could happen in the outside world which would consequently interrupt these couple of moments so much so that I feel compelled to write a blog post about it. We have one of those moments. We didn’t trade a player. A family was not split up by divorce. One of our own was abducted and sold as a slave to the bourgeoisie of the elitist east coast. 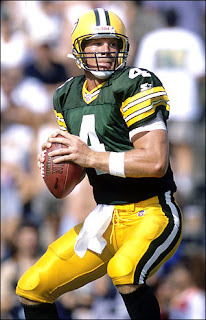 Brett Favre is more than the guy who broke records and delivered a super bowl trophy. He was the identity of a predominantly blue-collar state, that can’t tell you the starting line up of the Milwaukee Bucks and who also has dwindling hope that the Brewers might get to the playoffs, a place they haven’t been since the 82 World Series. Prince Fielder hit 50 home runs last year. No one will care next year. The Bucks took the 76ers to game 7 in the Eastern Conference finals in 2001. What happened to Glenn Robinson anyways? Brett Favre is the face of the Badger state. He is the pride of a state that otherwise is noted for cheese and beer. This is what Ted Thompson did not understand. Fans might not come right out and admit it. But I have a suspicion that Packer fans might be more satisfied with a 3-13 Favre leading the Packers season than they would with a 13-3 Super Bowl appearance with Aaron Rogers behind center. And speaking of Aaron Rogers, nothing against him. In fact if there is one person I feel bad for it’s him. He’s been great through this whole thing. But this is why it is going to a difficult year for him no matter how well he performs. He’s not just filling in for a legend, more importantly, he’s filling in for the guy that you’d love to shoot the breeze about at the bar in March. He’s filling in for the guy Wisconsin business travelers are proud to acknowledge when they are traveling around the country. He’s filling in for the guy, whom families have been proud to name their children and pets after for the last 15 years. My faith convictions teach me not wish bad for anyone, but if the Pack can’t win the superbowl I hope that Jets do and that Thompson and everyone else who backed his decision find themselves general managing some other organization as they ponder their mistake. This is not about winning and losing. This is business as usual. This is ripping out the heart of Wisconsin and sending it to New York. I'm the mom of two incredible children and the wife of one hot daddy who has abandoned his blog so I'm taking over.